This dish is fabulous for a relaxing Sunday dinner, but it is so easy to make, it can make a weeknight special too. 1) Pour a couple of tablespoons of olive oil in a large skillet, add onion and shallot and sauté until onion translucent. Add all dried spices and stir. Add garlic and sauté an additional minute. 2) Add crushed tomatoes, water, and a bit more olive oil (about two tablespoons). Simmer. 3) While sauce simmers, cook pasta according to package directions. 4) Add fresh basil just before serving. 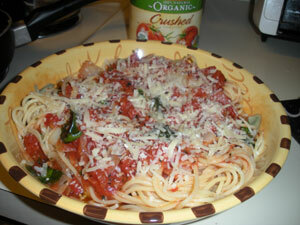 5) Put pasta into bowls and add as much pasta sauce as you like. Top with cheese, if desired. Serves about 5 people or sauce is great left over. Also freezes well.